Once you’ve gathered light tools and other camera essentials it’s time to set up. If your location is dark enough for a multi-second exposure, it may be too dark to compose your shot easily or permit autofocus. This is where a decent torch comes into its own, enabling you to illuminate within your frame for composition and focus purposes. In a scene illuminated by torchlight, autofocus should work effectively. 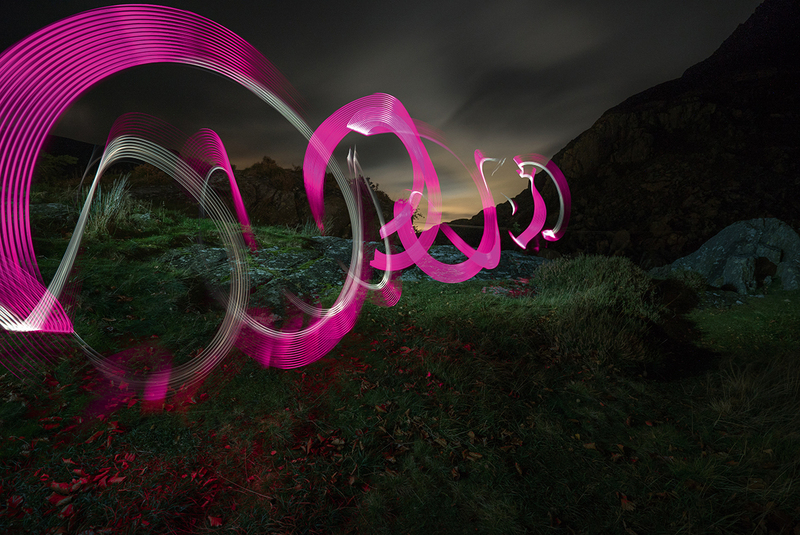 Try it by focusing your camera at the area in which you’ll be light painting. However, I find myself increasingly focusing manually using the excellent focus magnifier and focus peaking of my Sony Alpha 7s’ bodies – these features offer a zoomed live view of the scene and, within that preview, show small coloured highlights around elements that are in focus. In most cases you’ll need to switch off the camera’s AF to prevent the camera from trying to refocus when you next press the shutter button. To aid moving in the dark it can help to mark the boundaries of your working area with glowsticks or tape on the ground just outside of the frame, and use more tape (or sticks/pebbles) to identify positions from where you’re going to light paint. A 30-second test shot will help you to confirm your composition and give you an idea of the ambient light levels, photographically. You can shoot this at a higher ISO to speed up the test shot process, then drop the ISO back down to 200 and extrapolate the other settings for your final shot. Note, however, that while the exposure triangle relationship is linear, all settings are not created equal when light painting. On paper, settings of ISO 200, f/4 and 2 minutes would give the same ambient brightness as ISO 200, f/8 and 8 minutes. 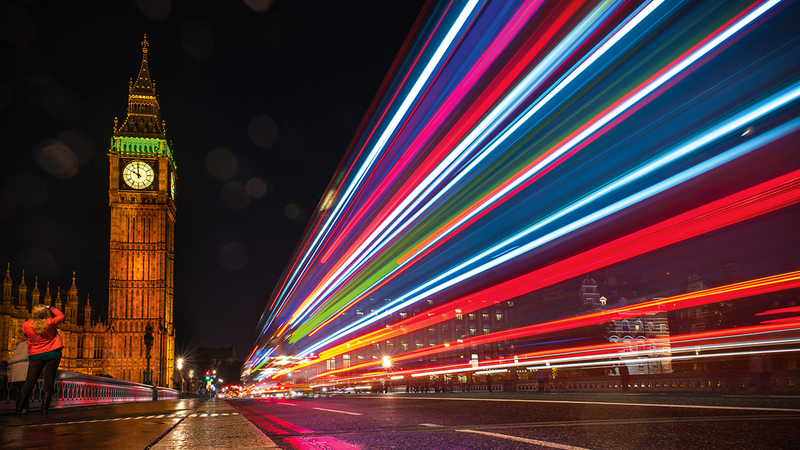 But unlike aperture and ISO, shutter speed has no impact on how much light from a moving source reaches the sensor – it only affects how long the trail might be. An aperture of f/8 is a typical starting point to capture the likes of fairy lights or light sabers, so calculate your exposure length from there, making reciprocal changes where required. 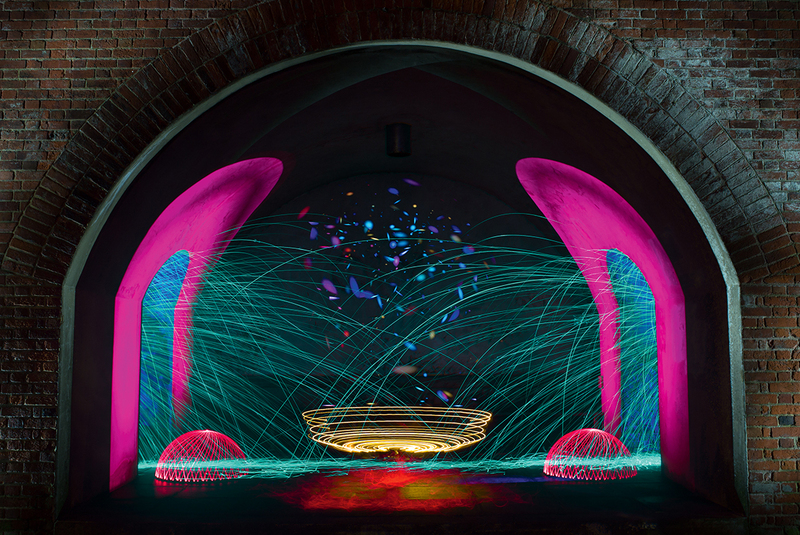 In all but the brightest environments a short exposure duration – 10 seconds or less – will result in a dark background, but the trade-off is a lack of time for light painting. Nonetheless there’s time to take a few steps across the frame or just motion your light past the camera. If you aspire to create grander patterns, consider shooting several frames consecutively and layering them in post production. Your cable release will be invaluable for this, acting like a finger on the shutter button to trigger images at your desired frequency. Meanwhile, longer exposure times gather more ambient light and can help convey an ethereal feeling, particularly if you’re in the landscape with clouds drifting by or trees swaying in the breeze. Remember to separate the time it takes to complete your light painting versus the time needed to gather sufficient ambient light. Throughout your exposure you have the opportunity to move through the scene, introducing light as you go. Handheld light, swung with fluid arm movements, introduces an organic sense of movement whereas light trails anchored at a fixed point – rotated around a light stand, for example – bring geometric precision. Waving lights around for minutes at a time is not for everyone. It demands a significant amount of creative vision, not to mention endurance. Instead it can be gentler on the mind and body to start your light-painting journey with a physical subject, and build a shot around it. Much of the approach is the same. Focusing on something – a car, for example – is always easier than focusing on nothing! With the right combination of technique, location and tools it’s possible to light a car in a single frame, although this approach will lead to compromises. The key to a strong final image is accepting that it’s going to take several lighting frames, often with different exposure values. Shooting separate frames for each ‘plane’ of the car, as you walk parallel with each side, front and rear, is a good target to ensure that you have captured light in and from enough angles. Further exposure-adjusted frames for head- or tail-lights and, of course, a base foreground frame, should give you all the files you need to complete your layering, without overwhelming yourself with too many frames to then have to work through in post production. 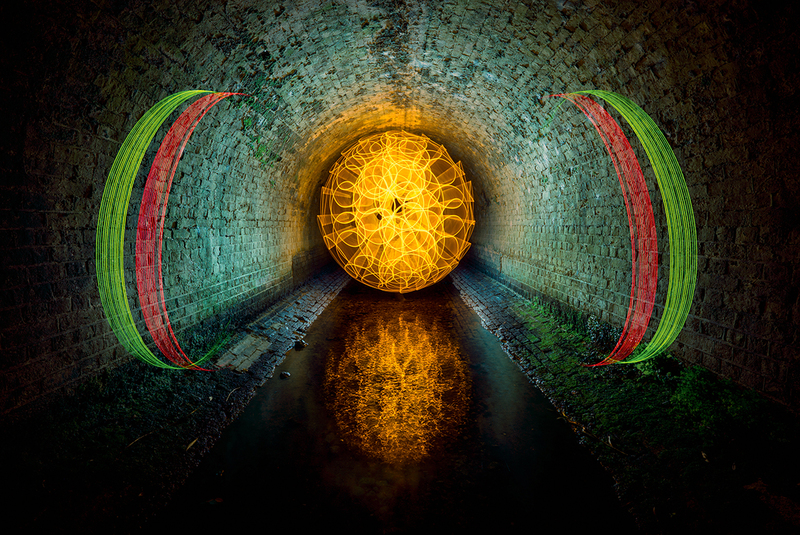 In many ways light painting can be likened to an extension of shooting traffic trails, with the head- and tail-lights of traffic replacing handheld lamps as the source of illumination. I often recommend traffic trails as the best starting point for newcomers to nighttime long exposures: again, use the aperture setting to control the brightness of vehicle lights and dial in a shutter speed that gives you the ambient lighting you’re looking for. As complex as this shot appears, it actually came down to timing. Having reached the vantage point a few minutes before sunset, I waited for those perfect few moments when ambient light levels dropped enough to balance the glow of fixed and moving lamps across the scene. 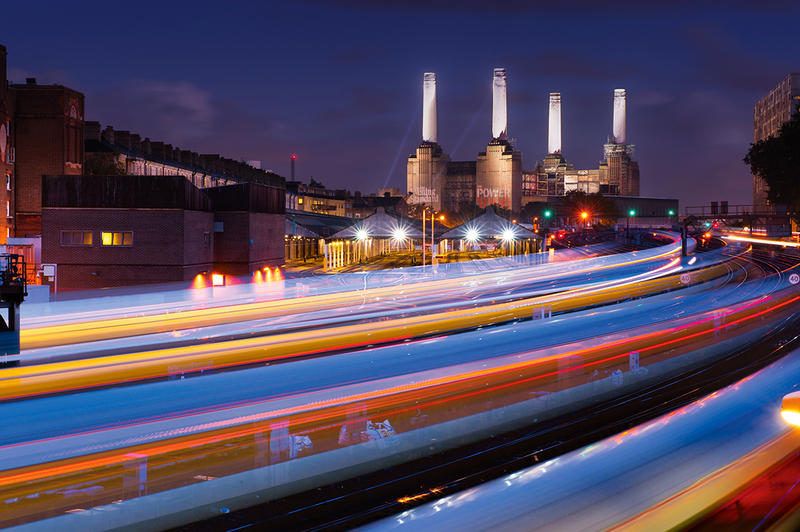 I knew I’d need exposures of 20 seconds or more – the average time it was taking for trains to pass through. Fortunately the variables converged to the same point in time – a fading sky and 20 seconds at f/11 – the aperture best suited to capturing these lights from my raised viewpoint. I kept shooting long enough for a train to pass on each set of tracks, then I layered my favourite frames in Photoshop. Continuous lighting offers an advantage over flash in that you can observe the effect of the light ‘live’ and make adjustments accordingly. As you might expect, a weak light held close to a car will create a very different result than a strong light held further away. Similarly, different aesthetics can be achieved by holding your light higher or lower. Cars usually look better lit from above but it can be a matter of individual taste. In most cases, a similar approach can be applied to other subjects, from simple studies in the comfort of a home studio to dynamic interpretations of monoliths amidst the landscape. You can, of course, apply illumination to the landscape itself. In this case, as before, experimentation around the relationship between camera, light and subject can yield dramatically different results with nothing more than a few footsteps one way or the other. Colouring your light(s) with gels is a good way to differentiate illumination from different positions. Expect 1-2 stops of light loss from your torch when using gels, however, which can be offset by any combination of moving closer to the subject; moving the light more slowly over the subject area; or adjusting the camera settings. 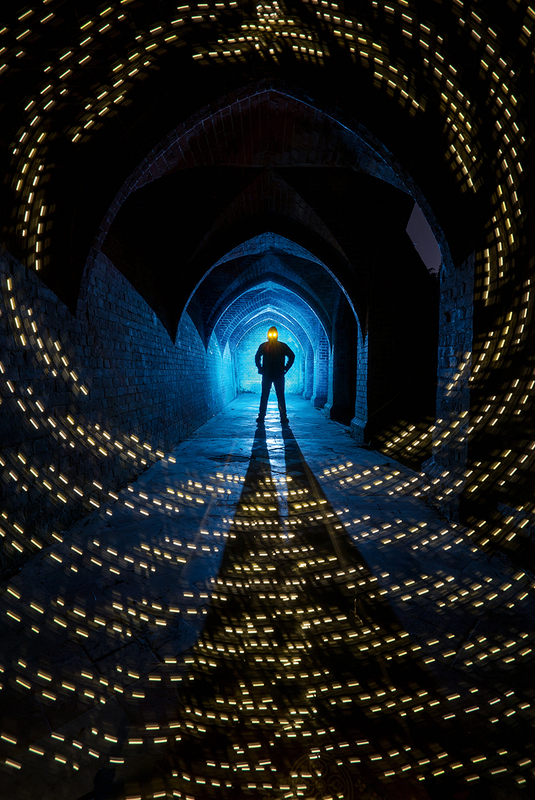 The unwritten rules of light painting suggest that images should undergo no editing once the shutter closes. Following such an ethos can be frustrating, especially if you make a mistake towards the end of a 15-minute frenzy of lighting. However, shooting to create a usable JPEG straight out of the camera is undoubtedly rewarding and may serve to motivate you towards constant improvement. How far you’re prepared to go in your editing software is a matter of personal preference, but as ever shooting raw will give you the greatest latitude to recover highlights and lift areas of dense shadow. Take time to nail white balance in camera, though, as having the ‘wrong’ white balance selected on location appears to have a significant tonal impact.